February 15. 2012 | By Valerie C.
I often gravitate to lady singers with deep, sultry, sometimes-hoarse voices. 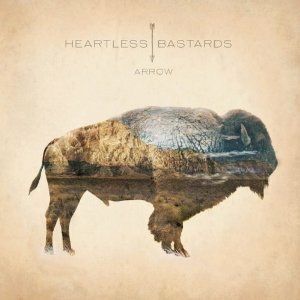 I’ve been anticipating getting my hands on the Heartless Bastards’, Arrow, for review ever since I caught wind of “Only For You” from KCRW’s music blog. Hearing Erika Wennestrom’s gorgeous voice is elating. Especially on such a velvety song made even more enrapturing by the combination of Wennestrom’s vocals and an aching guitar. In “Marathon,” the grit in Erika’s tone, paints a picture for me of long, tiring days of a weary traveler ready to go home. “Parted Ways” is rock and roll bliss. Arrow is a medley of songs that will have you cranking it up and tuning all else out. While there have been a few versions of the band, at the core is Wennerstrom. Over the years she has artfully tweaked the valves of the band, always trying to achieve auditory harmony. One can only hope that Wennerstrom won’t feel the need to change the current lineup for a while, because I’d love to be stuck with these Bastards a little longer. It’s serendipitous that a band named Heartless Bastards, would be releasing an album on Valentines day of all days, but these bastards are liars, because they’re all heart.